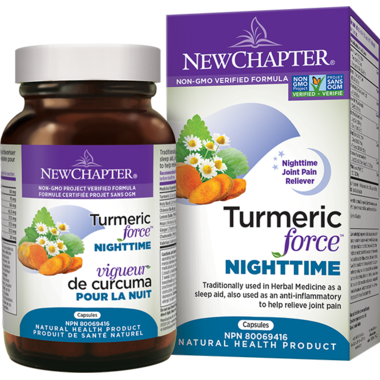 Traditionally used in Herbal Medicine as a sleep aid, New Chapter Turmeric Force Nighttime can also be used as an anti-inflammatory to help relieve joint pain. Directions: Adults: Take 2 capsules 30 to 60 minutes before bedtime. Non-medicinal Ingredients: Extra-virgin olive oil, maltodextrin, hypromellose (capsule), organic yellow beeswax, candelilla wax, organic olive oil, magnesium carbonate and silicon dioxide. Cautions and warnings: Some people may experience drowsiness. Exercise caution if operating heavy machinery, driving a motor vehicle or involved in activities requiring mental alertness within 2 hours of consumption. Consumption with alcohol, other medications or natural health products with sedative properties is not recommended. Consult a healthcare practitioner if sleeplessness persists continuously for more than 3 weeks (chronic insomnia). Consult a healthcare practitioner prior to use, if you are breastfeeding or taking any heart or blood pressure medication. Consult a healthcare practitioner prior to use if you have diabetes, heart condition, gallstone or a bile duct obstruction, stomach ulcers or excess stomach acid, depression or diseases related to depression. Contraindications: Do not use if you are pregnant. 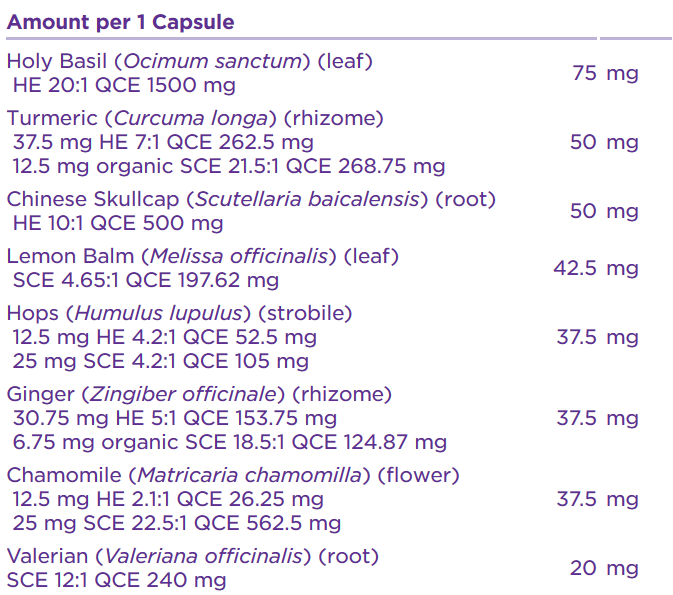 Do not use if you are allergic to plants of the Asteraceae/Compositae/Daisy family.